As Healthcare Simulation Education becomes more ubiquitous, it requires larger, more diverse teams to design and implement these programs. Adding elements of Interprofessional and Interdisciplinary Education increases the breadth and depth of personnel required to deliver a high-quality curriculum. Teams may span shifts, locations, and possibly even different organizations. Coordination of these disparate groups of people often leads to multiple threads of communication crossing different methods, enormous email chains that are often hard to follow and wander from topic to topic, and an inability to efficiently keep track of what was said, decisions that were made, and what outcomes occurred. The application Slack has some options to help mitigate this. Interprofessional and inter-disciplinary teams add layers and layers to communication and teamwork. Slack is a tool that can help streamline your electronic communication, and today Matthew Charnetski, MSMS, NRP, Director of Simulation Learning at NYIT at Arkansas State University and Adjunct Faculty at Drexel University, shows us why and how! Imagine if Internet Relay Chat (go waaay back), Twitter, and Skype had a baby. Slack allows streamlined communication, documentation over time, with clear and concise threads tying it all together. All in one location and interface. This hub for communication can be accessed from applications on your computer, smartphone, tablet, and the internet. One can text, call, video chat, share screens, search through old messages, and share files all from the same place. Some features or level of features must be purchased, but most functionality is free! Read on for 4 Steps/Tips for using Slack and a use scenario for Slack in a Healthcare Simulation Program. A workspace can be department-wide, project based, or however else one wishes to divide up access and communication. Setting up a workspace is the first thing that is done when signing up for Slack. Slack can support multiple workspaces in case a user is working with several different departments, organizations, or on different projects. Again, all depending on how the workflow is divided up. For instance, Healthy Simulation Experiment is now a workspace that one can join. Once a workspace is created, the user will be asked to create channels for further organization. Channels are governed by the use of hashtags to signify different channels and ways to divide up different topics. In this instance #blog-posts, #general, and #random are the initial threads. Users and administrators may add more channels as they become necessary to help designate different topics, projects, or any other threads that need to be tracked by the team. Suggestions for channels? Project channels #COM-Year1-GI-Lab, #PA-Year2-OSCE-Stations, #COM-Year3-PE-Prep for instance. Add some channels that allow for keeping track of essential elements such as #Program-Evaluation, #Accreditation, #EPAs, #Process-Improvement, or #Needs-Documentation. Put some thought in to how to organize these channels. While it is easy to add channels later, historical data will be better with strong channel and hashtag naming conventions. During creation of a workspace, collaborators may be invited. Slack also allows for a simple way to add collaborators through the menu in the top left of the main screen. Users may have different levels of access and for channels to be listed as private or public. Users can join public channels but must be invited to private channels. An administrator for a workspace can invite specific users by email to join a workspace or can share a url to allow access to the workspace. In this example, there are two users that are collaborating, charnets and M2. These users can participate in all of the channels that are available and can directly message one another. Within the channels that have been created, any collaborator can be addressed directly or specifically called out by using @username. For this example, @charnets or @M2. This post only begins to scratch the surface of how one might use Slack to improve communication. Slack allows for recording conversations and threads relevant to a specific project. Files can be shared and uploaded directly to shared drives on Dropbox or Google. Video chats can be conducted for meetings with collaborators who are not geographically available. In the end, the only limits on how one might use Slack are limited by their creativity and adaptability to use this tool to meet their needs. A new project is requested by faculty for an Interprofessional, In-Situ, simulation program in a local hospital. The Healthcare Simulation Team is housed at a local university not directly affiliated with the hospital requesting the program. University Simulation Center has a Slack Workspace for their program. Channels exist for daily operations and communication with their in-house team and IT. 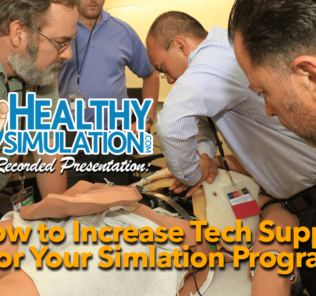 After receiving this request, the Director of Simulation reaches out to the Healthcare Simulation Coordinator who is responsible for orchestrating the logistics, curriculum design, assessment, and evaluation of the requested program. The Simulation Coordinator creates a Slack channel called #IPE-Hospital and invites the Healthcare Simulation Specialist, Healthcare Simulation Technician, representative from IT, and the Clinical Faculty from the Hospital to join. The Coordinator is able to direct activities for the event while also sharing documentation for the creation and operation of the simulation. During the process, the Faculty have a question about the center’s capabilities related to central line maintenance. The Coordinator tags the question with #capability and sends a direct message to @Specialist and @Tech to ensure they weigh in. It’s a busy day in University Simulation Center, the Specialist and Technician are not able to check in on the conversation until much later in the afternoon. In the meantime, the conversation continues, and the question disappears into the volume of text that has occurred. Fortunately, the Slack notifies them that they have a direct message and draws their attention to the question which they answer in a timely fashion. The use of a standard naming convention for categories of questions allows searching for topics and questions, ensuring answers have been delivered. Though the Faculty are currently working the night shift, they are able to circle back to their question with the search function and find the response. This allows them to continue working on their part of the curriculum design despite being geographically separate from the Simulation Team and working on a completely different shift. The process continues and the Coordinator calls a meeting with the Specialist, Technician, Faculty, and IT to finalize specifics for the event. Tagging these messages with #1st-logistics-mtg allows for isolation of the conversation about the meeting amidst all of the other conversation. Without Slack, there would have been several phone calls and voice messages and a series of emails back and forth to look through to determine a meeting time. In Slack, the back and forth is limited to the channel and can be seen in one place more like a conversation than an email thread. Unfortunately, the Faculty are unable to come to the center. The Coordinator schedules a video chat and they each join through Slack. Sharing her screen, everyone in the conference is able to see the same information while the Coordinator takes notes in a Google Doc through Slack, with no additional effort the notes are in both Google Drive and Slack. The following day, the Director needs to know the status of external programs unexpectedly. The Director is able to open Slack to get a general sense of where things are in the process including the fact that there was a meeting yesterday and what the results of that meeting were. The event comes and goes as smoothly as possible. During the post-event debrief, notes are taken in Slack, putting them in the channel and on Google in one step. Some issues were solved, but others will require more thought and planning to resolve. One issue was confusion on who needed to provide labs and images. Clinical Faculty thought the center had a large repository. Center staff thought it would come from clinicians or subject matter experts. The Simulation Coordinator creates an additional channel called #Labs-and-Images for a discussion about what tools are available and how best to coordinate the gathering of this information for future events. After the event, the Director exports the channel and adds the file to the appropriate Google Drive folder. Using Slack, the conversation is recorded and can be placed with other relevant pieces of documentation. If the same faculty return, other faculty wish to do something similar, or programming information is required for accreditation of the center/program/school/hospital, the documentation is readily available in one convenient location. As with any piece of new technology or application, Slack takes a little getting used to. Walk through the steps above, think about how to structure the communication with some wiggle room for adaptation in the future, and start gently. Slack is as simple as using any messaging app with the addition of powerful functions that allow for the collaboration of Healthcare Simulation Teams for Curriculum Design, Program Evaluation, and Operational Needs. Learn More About How To Enhance Simulation Team Communication Through Slack!